First off, I want to thank you all for your suggestions and invitations about my last post! Sharing is caring as they say, and I’m super grateful and happy for all your excellent tips! Road trip excitement awaits. While I’m dreaming about summer fun, I have to first content with life. And at this very moment in Vancouver, it’s cool and wet and dreary. It doesn’t feel like June should. So I’m going to harken back to sunnier days when I made this simple dish. Summer will be here soon, right? 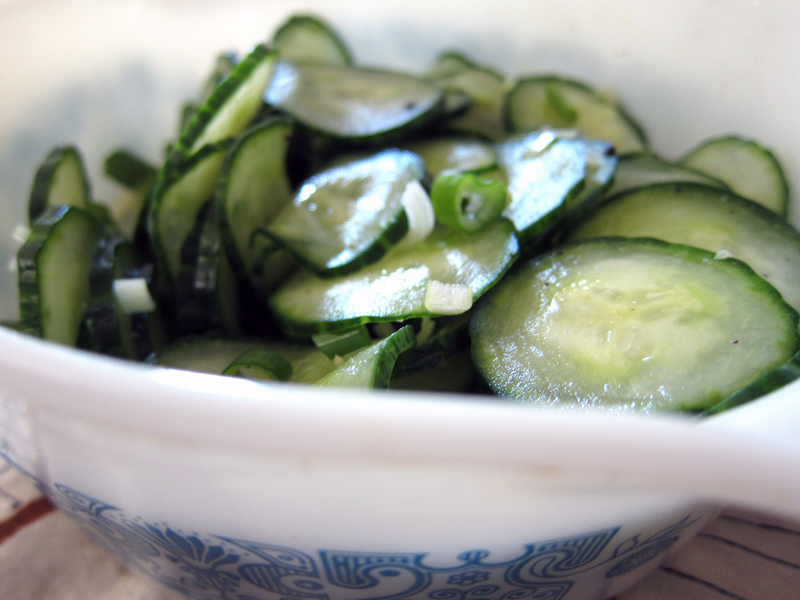 This cucumber salad is refreshing and light and crunchy and pretty much perfect. The original recipe called for dill, but I didn’t have any fresh, and didn’t want to use the dried stuff. So I went with green onions. It pays to experiment because my husband went a bit nuts for this salad. He loved how the green onions worked with the cucumbers and couldn’t wait until we ate this again. Tangy, slightly sweet and full of yum. A perfect salad for picnics, barbecues, and large gatherings – just double or triple the recipe! Enjoy and think of summer. 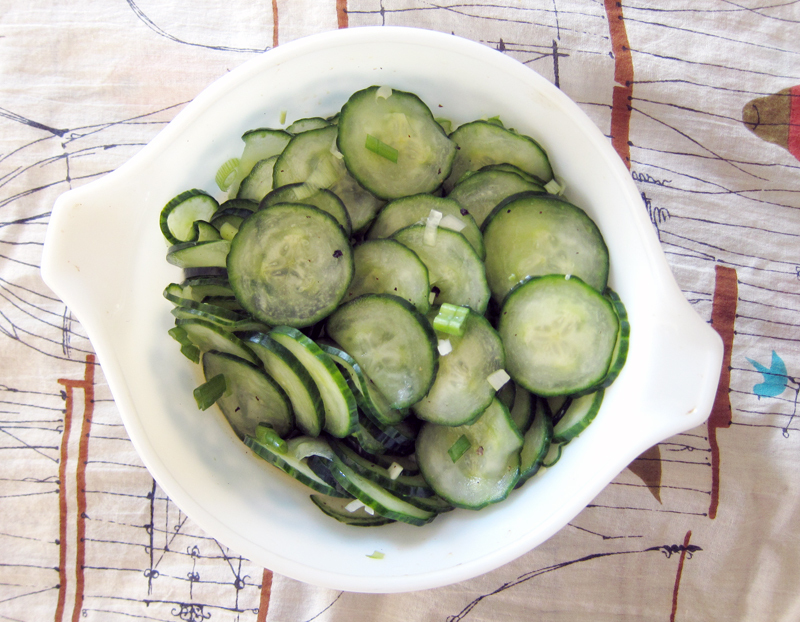 Place cucumber slices in a colander or wire mesh strainer and sprinkle kosher salt over top. Toss well to coat. Let sit 15 minutes, stirring occasionally. Meanwhile, mix dressing ingredients in a large bowl, mixing well so that sugar dissolves. Drain cucumbers and pat dry. 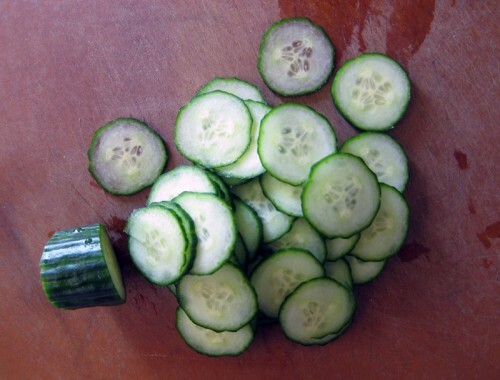 Add cucumbers to dressing and toss well. Refrigerate 15 minutes or up to 2 hours. Serve cold. You had me at sweet and sour – I’m always a big fan of that combination…nothing beats a cucumber salad – even on a dreary day. Have so much fun on your roadtrip! You posted the PERFECT recipe! I just bought 2 English cucumbers and was trying to decide what to make to go with our burgers. These cucumbers sound really good. With this salad you’re halfway to my mom’s Greek summer salad. She uses green onions in her salads during the summer since they are plentiful in her garden along with fresh dill, cukes, romaine lettuce and tomatoes. So simple, fresh and addictive. Red wine vinegar, olive oil and salt. Viola! I’ve never really been able to get into cucumbers but maybe this sweet salty combo will reel me in! Glad I could help with your cucumber overload, Peggy! Enjoy the salad. Good to know, Joanne! I just got to start liking fresh tomatoes….I hear it’s a similar distaste like the people who hate cilantro. I’m trying though….small heirloom tomatoes I can do! I’ll try out your mom’s Greek salad recipe this summer for sure! Thanks. Joanne, I used to hate cucumbers something awful, but tastes do change. 2 years ago I started coming around and now I love the stuff! i ADORE cukes and carrots this way! wouldn’t this be good with sourdough croutons? That looks so yummy that I just had to pin it. Hopefully we will get some cucumbers from the plants in our garden and then I will have this recipe. vanilla, I like how you think!! Sounds like a plan. Jennifer, good luck with your summer garden! Keep these in mind. I’ve made this recipe several times now that you’ve posted it and I love it. I’ve tried switching out the vinegars too and have used rice vinegar and cider vinegar instead of the white wine vinegar (though I think the white wine vinegar was my favorite). I also have used chives instead of green onions. Delicious & have passed this recipe to friends. Keep up the wonderful posts! Just made this last night and it was so good I made another batch after dinner so we could have some today! I added some very thinly sliced red pepper and it was even better after soaking all night. Thanks for another delicious and easy recipe.